I suspect shorter nozzles are more popular nowadays not because of the intrinsic value to the user, but mostly because they use less material for the manufacturers! With or without a flat ring around the throat? This characteristic has a bigger impact than the length in my opinion. "Pointy heads" like the latest Ultimaker 2 nozzles reduce the unwanted heat transfer to already deposited material, as the surface in contact is smaller. And, just like the longer nozzles, they offer a better view on what is going on. Now, the thinner and the more fragile: crashing hardly the hot end on the print surface may deform the nozzle beyond repair. protoparadigm analysis on filament tolerances). I usually prefer flattened heads though, like that of the Makerbot above, or as shown on the left: they allows fatter threads, as they get squeezed in between the nozzle and the previous layers. For the same reason, they withstand better abusive flows (e.g. to get a sturdier part, but I mean 102 or 103% extruded rate, not more!). And while they drag more existing material around, flattened ends tend to "clean" existing blobs of plastics better than pointy nozzles. The main drawback is that they transfer more heat to the already deposited material. For tricky parts like a very small tower, they do have a negative impact without proper cooling. Better activate so-called Z-hop or "retracted" cooling in between layers, instead of staying in contact while trying at the same time to give more time for the layer to cool down (so-called "minimum layer time")! So without a flat ring on the end, you need a well tuned setup and a very repeatable positioning. Even a slight over-extrusion will give dirty prints, like furrows in the layers. 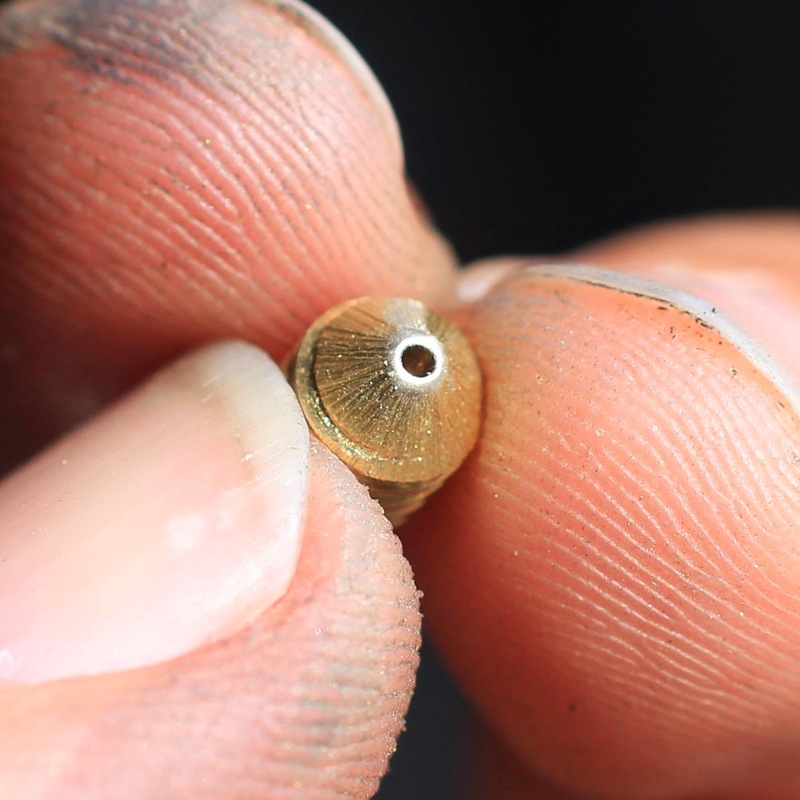 Overall, I recommend nozzle shapes without a flat outer ring only for small diameters (e.g. less than 0.4 mm) and for high quality prints. Most of the time, a significant flat end is both better and sturdier in my opinion. Explicit, useful embossed size of the nozzle (0.8mm). but I suspect the main motive was to spare material! As soon as you have different nozzles, having a way to identify them precisely is a must, unless you manage to keep them on separate boxes (but now, what is the size of this nozzle on that spare printer I did not use for months?). And even it is somehow possible to guess the size with the naked eye and some practice... and when the nozzle is clear. It is impossible when it was left with plastic in or around it (the usual end result of a print unless you clean it thoroughly). Some manufacturers use cryptographic dots (huh), some have explicit sizes (which I like better), but in any case more of them are doing it. Now, when you do not have any markings on your existing nozzle, just make them yourself with a small file on the side: one mark for each 0.1 mm for example. Here again there are different strategies, but no definitive answer in my opinion. I only would recommend to stay away from uselessly thin conduits like that on markerbots below: they uselessly increase the friction due to the viscosity of the material, especially at low temperature. Comparison of the inside of 3 nozzle shapes, from Jerril.com. Stay away from uselessly thin and long cavities! Too short terminal throats like that of the middle nozzle above are no good either. 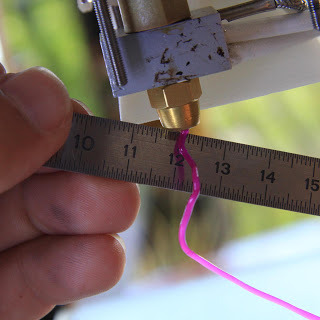 The filament should better stay "straight" for some distance before getting out (3 or 4 times the diameter of the nozzle). Else it bends once out, which is annoying when priming. Priming a funny 1.1mm homemade fat nozzle, made out of a round head nut. The conduit is usually too short with such nuts, which tend to bend the filament mid-air. Ryan Carlyle raised another property, the interior taper angle, which may be very hard to know from the outside. Let me quote him from the comments of this post: "[...] a steeper drill taper between the full-bore section and throat decreases extrusion back-pressure and improves reliability. 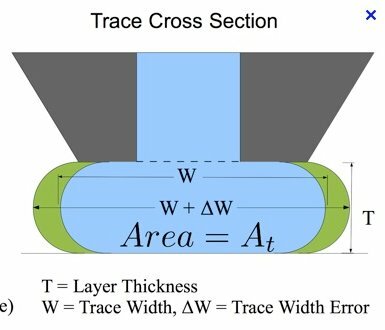 For example, E3D recently switched from two 120 degree bits in a stepped profile to a single steep taper drill bit. Makerbot made that switch years ago. (Molten polymers are viscoelastic and don't like to change diameter and linear velocity fast)". I suspect that a proper extruder will generate enough pressure to overcome this viscosity, but in any case when you need to know about chemistry and material properties, Ryan is extremely knowledgeable! 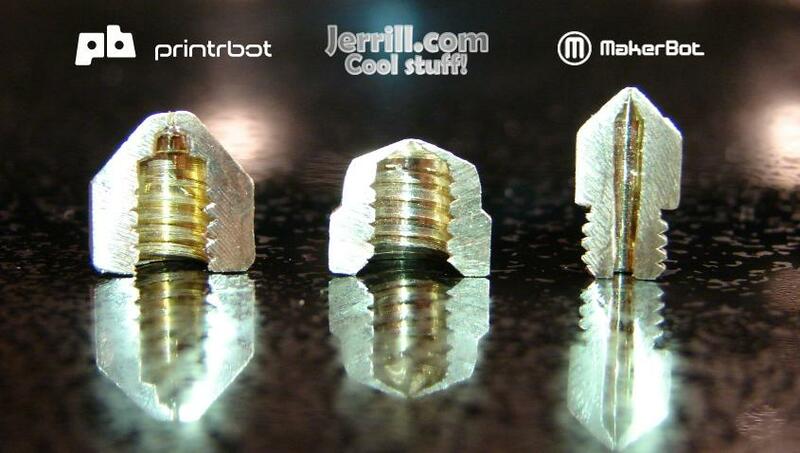 Nozzles were originally made out of brass, a nice material to work with at home (see my thoughts about hot ends). At some time, a few "single body" were available (integrated heating block + nozzles), mostly to get rid of any possible leak. 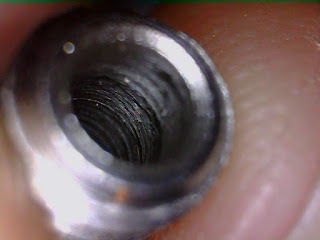 They were often all aluminum because of the heating requirements, but this material is just too soft as a nozzle: after a crash on the bed, the nozzle will deform and it is quite impossible to bring it back into shape. 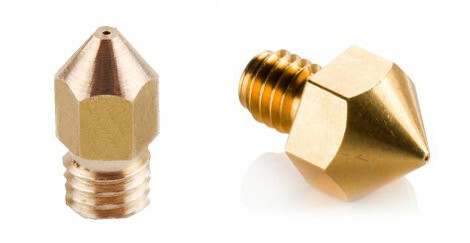 More nozzles are produced out of stainless steel nowadays. This is not because they print better but because they wear out slowly compared to brass, as shown in this detailed analysis by E3D. Stainless steel is obviously recommended for abrasive filaments, like carbon-fiber, chalk- or metal- loaded special polymers. Interestingly, the 4-5 Kg of Protopasta CFPLA that went though my nozzles did not wear any of my nozzles. This may be due to a lower content of carbon than that of other brands (given this comment). Brands names vs. cheap stuff? 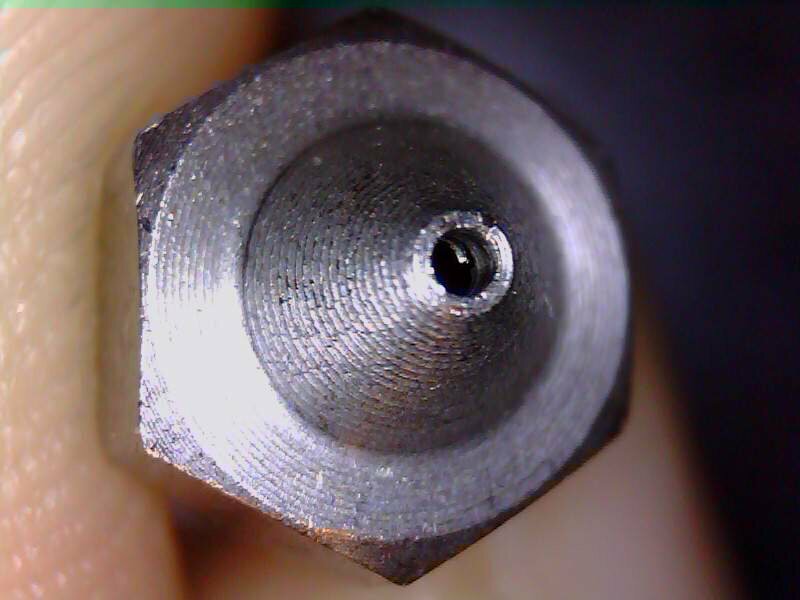 I used to make my own nozzles, and I tried many commercial ones (not all of them obviously, and some like the dura-gem nozzle are really interesting). I recently bought a few $1.59 stainless steel nozzles from ebay to give them a try (0.24, 0.4 and 0.8 mm)... And I must admit that they are good enough to the point I will probably never make my own again (hey, it was years ago, when a lack of choice and of competition kept prices much higher!). the filament is fully molten (not much friction to be feared). This would certainly not be good for a barrel though! First, the inside is not well polished, as you can see on the picture on the right: this is no surprise as it is a costly part of the process... PLA sticks well to stainless steel, contrary to most other materials. 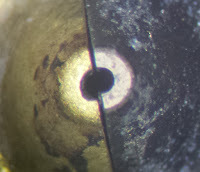 Would the barrel be so badly polished it would be a major no-go (the barrel is where the heat melts the filament, and where most of the friction occurs). But I do not think non-polished nozzles are a problem. The filament is fully molten at this stage and the drilled hole is much larger than the throat diameter. 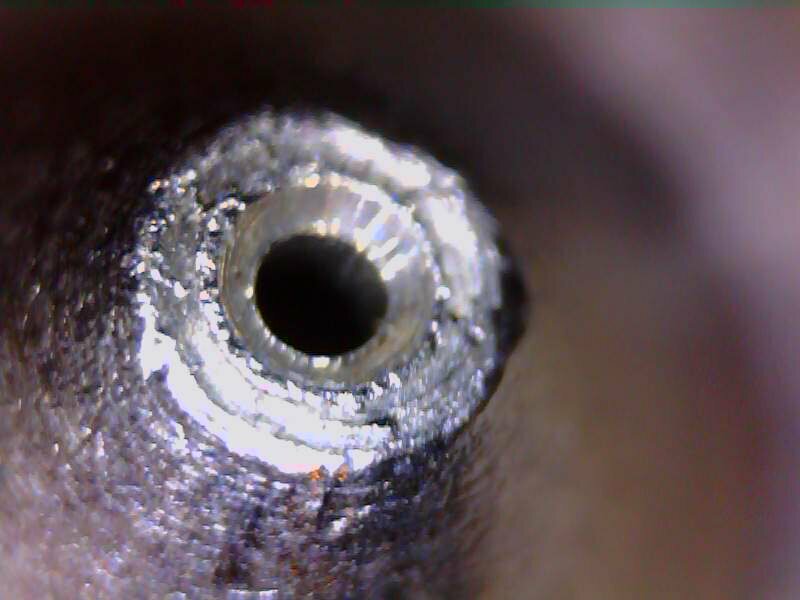 Interestingly some manufacturers offer 1.75 and 3mm filament-specific nozzle variants, but I doubt it matters a lot: molten 1.75mm is the same as molten 3mm for a given nozzle output. (it may not be so obvious though given the interior taper angle we talked above). To stay safe and given poor polishing, I would still recommend to buy the "3mm-filament nozzles" even when your printer uses 1.75 mm filaments. 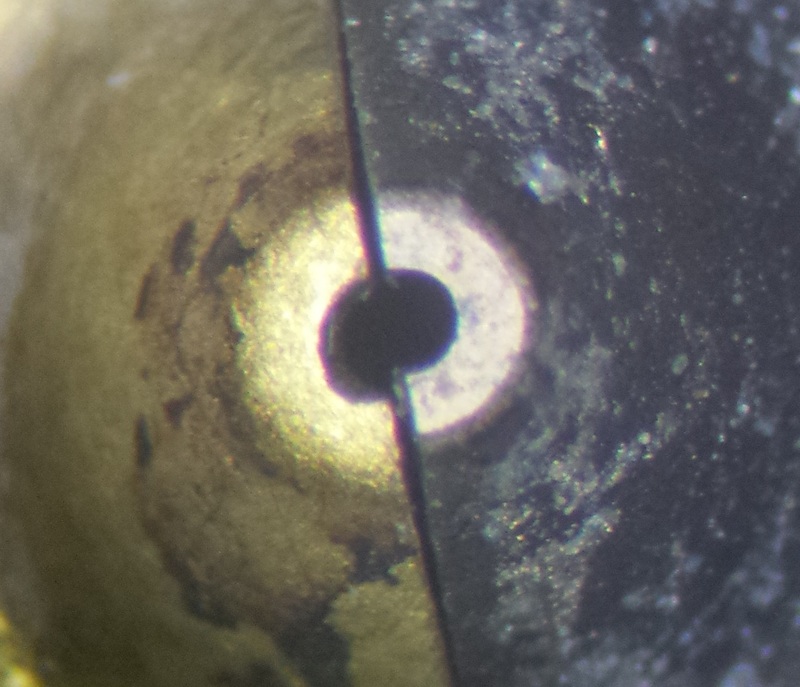 Admittedly, it may ooze a bit more as the "magma" chamber is larger... please tell me if you compare the two! Back to the cheap nozzle: more annoyingly, the outer flat ring is far from being smooth! 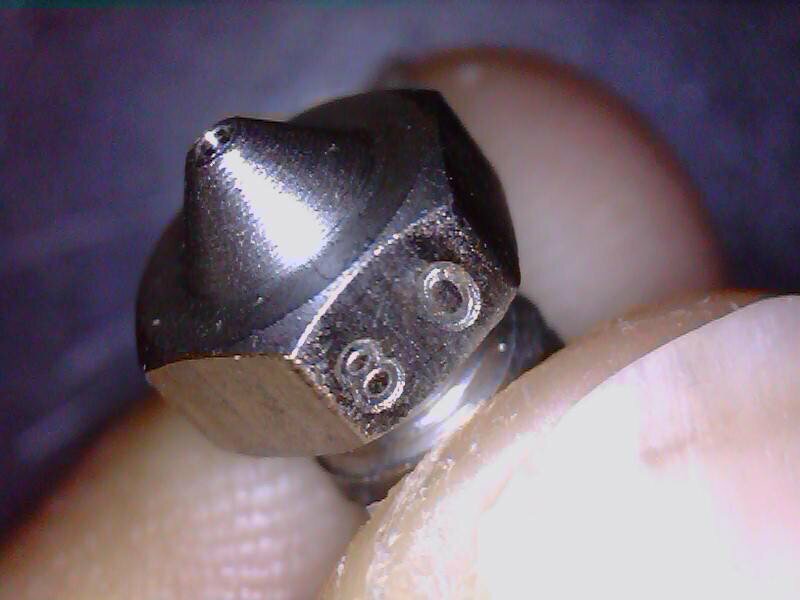 As shown on the picture below, this $1.59 is certainly do not compare to a perfect high-end $21 hardened steel E3D nozzle... no surprise again, quality comes at a price! The tip is ugly though. The nozzle throat itself is OK (was it "cowardly" chamfered?!). and they are annoying when priming as the filament bends back on itself or onto the nozzle. All in all it is a bargain at this price. Moreover it can be improved at home with some polishing (either with a polishing stone or with extremely fine sanded paper, and very gentle pressure). I just will have to be very cautious to keep it perfectly flat as any angle here will have a large impact when the filament tends to flow in an anisotropic way. The best way to proceed would probably be to mount the nozzle on a longer threaded tube.